After growing up only being allowed to listen to Christian hymns and classical music, senior Melody Cook has come a long way in her musical education and conducted an original piece at UCF Celebrates the Arts. 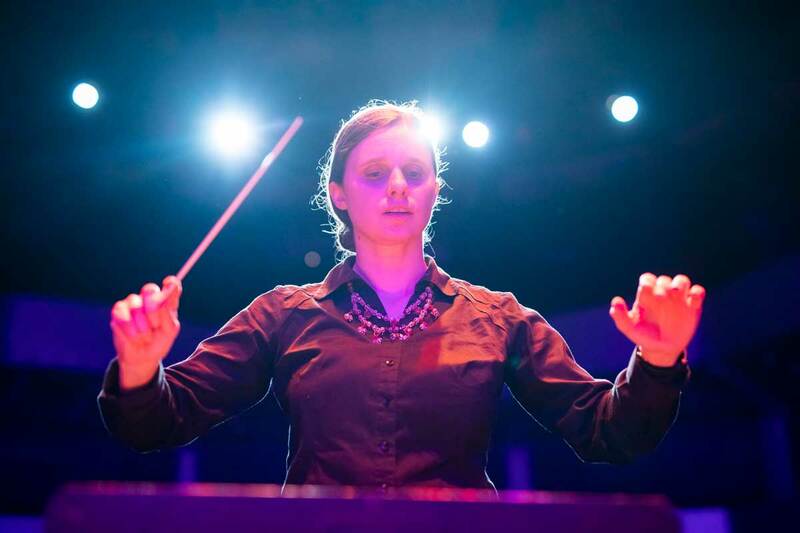 From the moment Melody Cook stepped to center stage Sunday at the Dr. Phillips Center for Performing Arts, she transformed from a UCF student into a conductor of a 9-person orchestra debuting her original composition in front of an theater audience. The fact that the 41 year old decided to pursue a degree in music performance and a career as a piano teacher is not all that out of the ordinary. 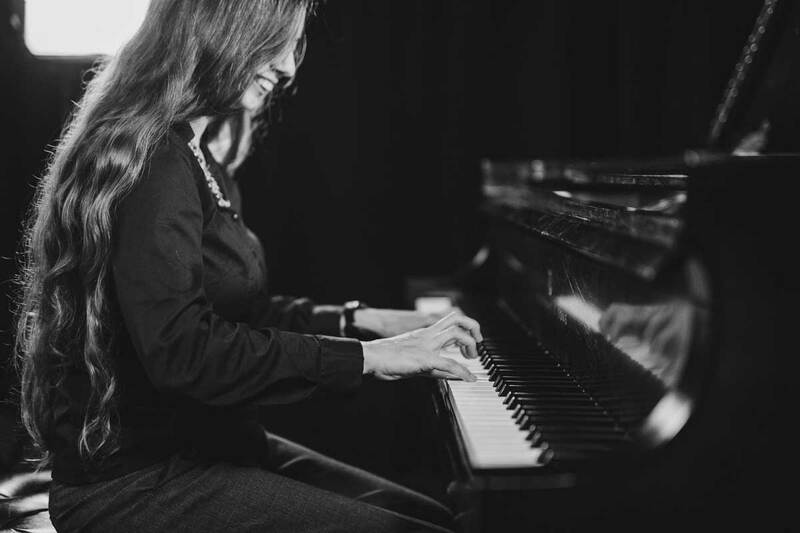 She’s had the urge to play ever since she was a toddler who used to reach up to plunk on the keys of her mother’s piano in their Tennessee home. What is unexpected about Cook’s story is that for the first three decades of her life, she had no exposure to most music genres and artists — from The Beatles to Duke Ellington to Dolly Parton to Metallica and nearly everything in between. As the second oldest of six children, Cook says she had an ultraconservative upbringing and says the homeschool program her family subscribed to was very restrictive. Cook — who learned from her mother how to play the piano — was allowed to listen to hymns or classical music, but anything with a bassline was off limits. “If you couldn’t listen to Christian music that has a drum, then you definitely were not going to be able to listen to most stuff,” she says. She didn’t think early on that college was an option because, like her limited exposure to music, she was taught college was a place of destructive and damaging influences. Instead, she spent most of her 20s doing mission work in Moscow and Siberia before moving to Orlando in 2012. She was making minimum wage in a kitchen, hardly clocking enough hours to support herself, when the realization hit her — she did not want to live the rest of her life this way. The answer: art or music. She enrolled at Valencia College with the goal of transferring to UCF through the DirectConnect to UCF program and cried with joy when Valencia Professor Alan Gerber told her she had what it took to pursue music. To her, those tears were proof she had pinpointed her passion and future path. As a result, her world has opened up exponentially. Cook says she had a steep learning curve to try to catch up to her classmates. She took a jazz theory class at UCF and spent hours listening to WUCF 89.9 FM on car rides to train her ear to the new sounds. She is enrolled in UCF’s analysis of hard rock and heavy metal course. She never knew Mötley Crüe existed until a couple months ago. She says Black Sabbath is a little intense. She heard Bon Jovi’s Livin’ on a Prayer for the first time when her class discussed glam rock. She says she doesn’t have any particular favorites. Because there’s so much she hasn’t heard, she tries to listen to something new every day. UCF Assistant Professor Alexander Burtzos, her current composition instructor, describes Cook as an ideal student. He says we all grow up in our own musical bubble to some extent, and all that really matters is whether we have the determination to break out of it. In the immediate future, at least, she will have her senior recital April 21 when she will lead a performance of a compilation of her work, and she expects to graduate with honors in May. Her recital will include the composition Loss, which she debuted and conducted at UCF Celebrates the Arts on April 7. She first composed Loss as a way to grieve the death of her grandmother, the last of her surviving grandparents. She was unable to attend the funerals of her other three grandparents, but she made it to this one and wrote the piece as a tribute to all four of them. She continued to tinker with the piece — which does feature a drum kit — before she really got serious about polishing it after the opportunity arose to contribute something for the New Music Ensemble concert at UCF Celebrates the Arts. Burtzos says Loss is composed in a style that is quite different from Cook’s usual aesthetic — it’s tonal, sorrowful, melodious, and to his ears, seems grounded in the folk music of Russia and Eastern Europe. He says he admires her ability and willingness to embrace different sounds and styles in her music. As for Cook, she is pleased with the way the piece turned out and the journey it took to get it there. At one point, she had composed it in her head for a full orchestra, even though she had never experienced an orchestral performance. Knowing what she knows now from her studies, she says the balance would have been completely off and it would have sounded horrible. Ultimately, she is most pleased because she feels that the ones she wrote it for would appreciate her work. After she graduates, Cook wants to continue to teach piano lessons, develop her music studio and write music she can share with the world. And now that college has opened the door to so many new experiences, she never wants to stop pursuing new challenges and opportunities for personal growth.